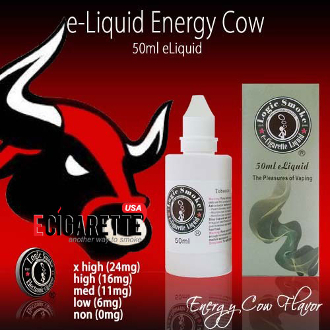 The crisp, refreshing flavor and aroma of your favorite name brand energy drink integrated into our Logic Smoke Energy Cow e-liquid. All the flavor of your favorite energy drink, without the caffeine and this one won't "give you wings"! It's the best of both worlds in vaping experience! With the perfect blend of an 80/20 PG/VG mix (propylene glycol and vegetable glycerin (organic, food grade preservative compounds), you'll get the best flavor concentration along with the perfect amount of vapor to satisfy your vaping needs.